August | 2012 | ride. travel. live. 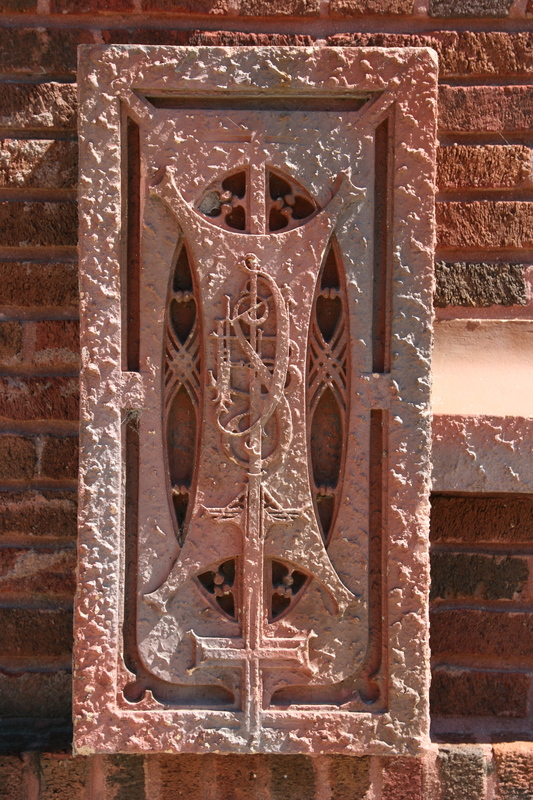 The building was constructed in 1913-14 for $15000, on a low budget, but Sullivan designed a small gem. The economics and the siting dictated a small structure, in a small town in northern Iowa. 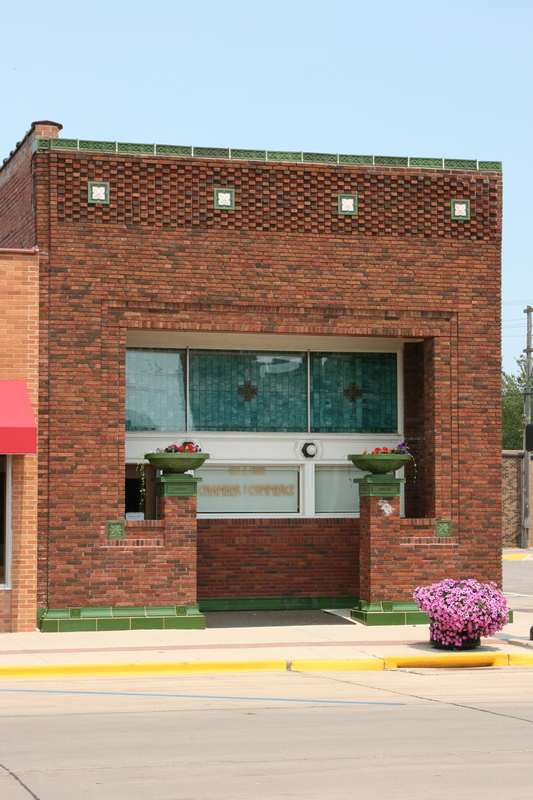 Also known as the Algona Land and Loan Office, it’s a one-story structure now housing the Chamber of Commerce. The decorative palette is limited, with a cornice line of alternating recessed brick, punctuated by green / white decorative tile. The side elevation is similar to many of the other Jewel Box banks, with a row of windows and tiled columns. The entire building rests on a base of green glazed tile, giving the appearance of the building literally growing out of the ground. 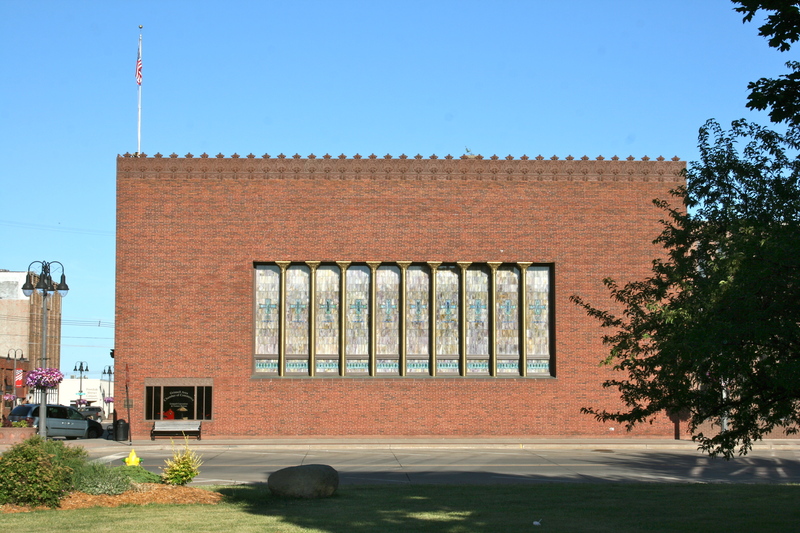 The main facade borrows a page from Wright’s Unity Temple, with the main entrance accessed by stepping into a ‘picture frame’, and then behind a head-high planter. So the building surrounds the visitor before entering the front door. And the beautifully restored planter. . .
Much of what is seen today is the result of a major renovation, as the building was in poor shape up until around 2000, and has since been restored to its current appearance. As in Newark, the building went through a series of tenants, including an insurance agency and a men’s clothing store. The insurance agency tacked on a tasteless addition to the back in the 1950s, and the clothing store owners badly disfigured the entrance and hacked out the stained glass windows. 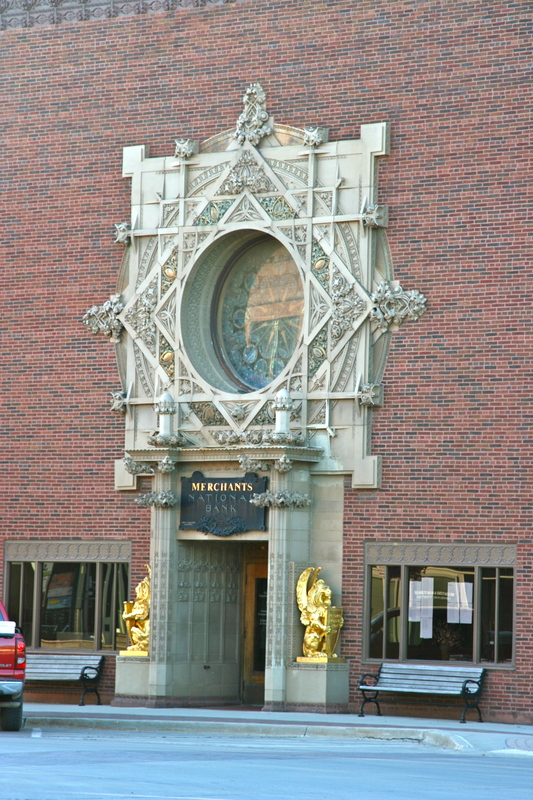 The planters were removed in the 1970s, the stained glass windows were sold in the 1980s, became basement decoration in Minneapolis, before ending up in Chicago. 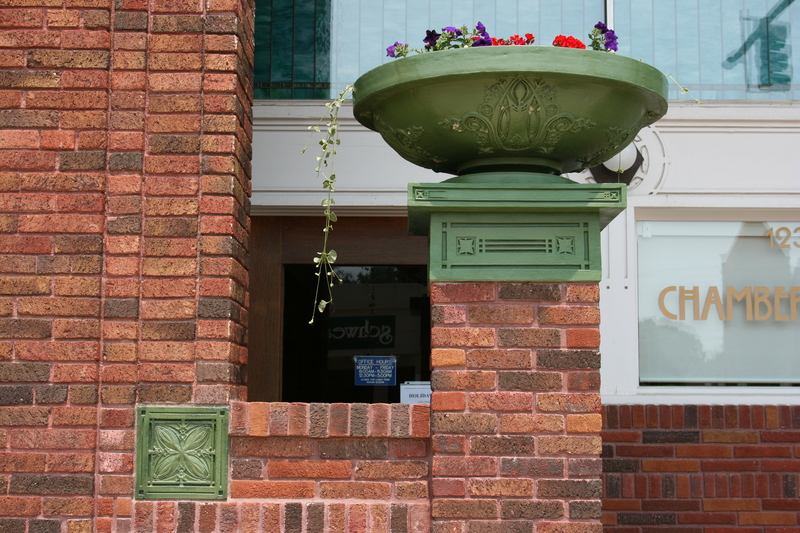 The panes were located and returned to Algona, and the planters have since been recast. The brick is apparently new. A small hint of the old structure is located in the rear of the building, with what appear to be the old brickwork remaining. Algona Land and Loan, now the Chamber of Commerce. Note the green tilework at the base. So the building is now looking good, while it’s one of Sullivan’s more modest structures, it bears all his hallmarks of scale, style, and dignity. The restoration, BTW, was an effort between concerned citizens of Algona and a number of Chicago firms (VOA, John Vinci). 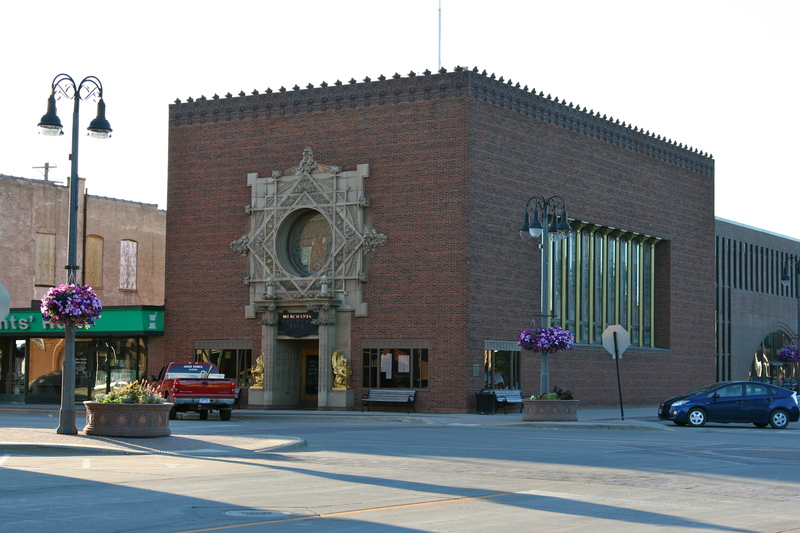 I revisited this structure recently, and described it in an earlier blog entry on Louis Sullivan’s buildings in Iowa. Completed in 1912, this is the most subtle of Sullivan’s Jewel Boxes, and his least exuberant, with a rather sober brick facade and a minimum of decoration. It lies across the river from downtown Cedar Rapids, and the building sustained major damage in the flood of 2008. 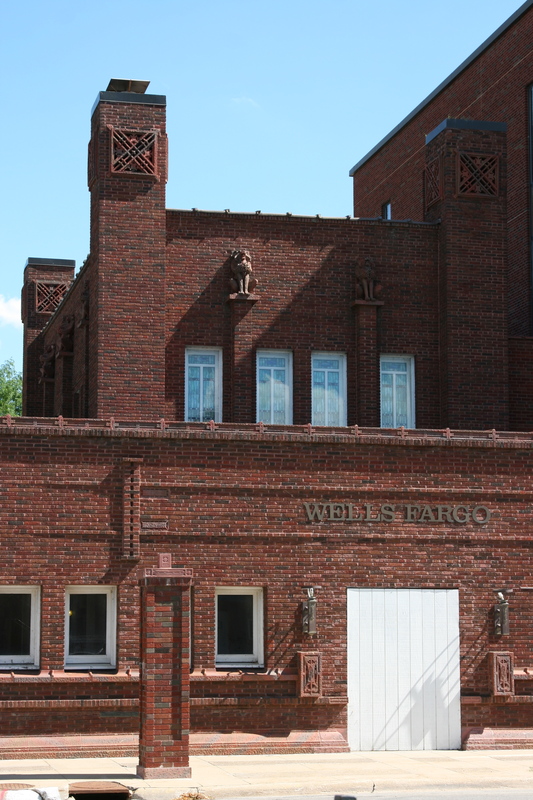 As of today, it remains vacant, although it is still owned by Wells Fargo and there appears to be some effort to fix things up. The building is currently threatened, not only from the flood damage, but also from plans to beef up the levees to prevent a repeat of the 2008 flood. 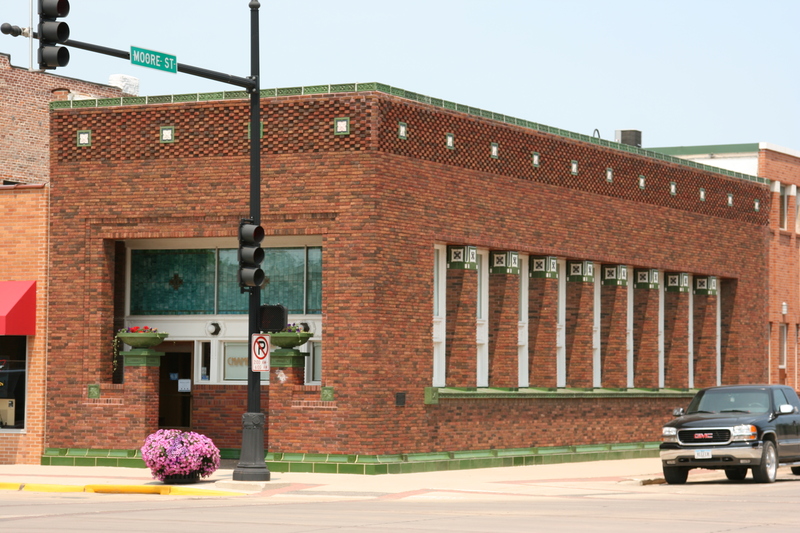 The shape is unusual, not a box like his other banks, but a more complex double box form with a wide base and a smaller, central second story, and satellite light fixtures also designed by Sullivan. Above the main entry is a space for the sign, delineated by a very gently curving layer of brick. 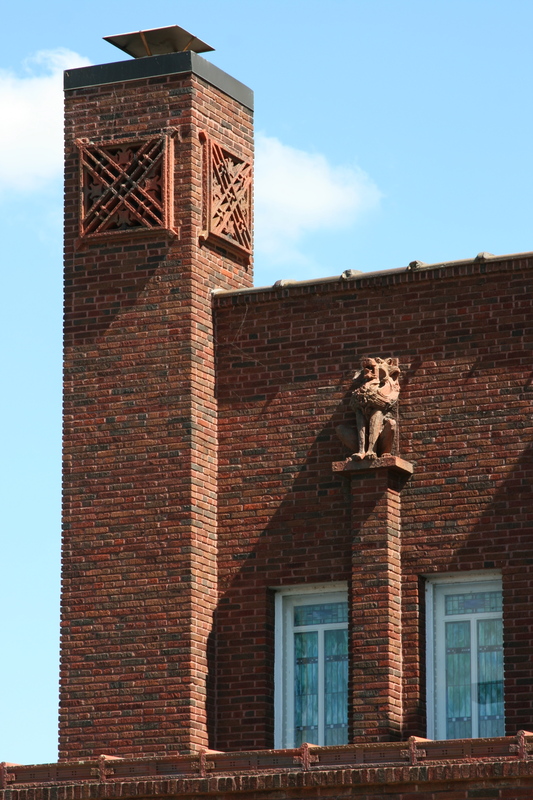 Along the sides are motifs spelling PSB, the initials of the bank, and on the top Sullivan introduces the gryphon that populates many of his bank buildings.